Giant Tiger is one of the best discount store chain in Canada. 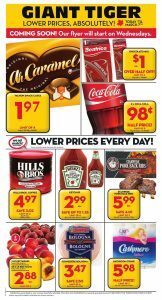 You can save with no coupons required at their stores just take a look at this week’s flyer! They guarantee price match and it has awesome weekly and daily sales. Sometimes there are clearance on home decors and apparels. Also some special days or weeks like Christmas, Canada Day, etc. you should browse entire flyer to maximize your saving. In addtion, almost every week, offers of them include half price deals on unexpected products. Make your weekly shopping list with Giant Tiger. Make your backyard awesome place. Sofa Sets, Chair and Pads, Conversation Sets and Bistro Sets can be found at fair prices. 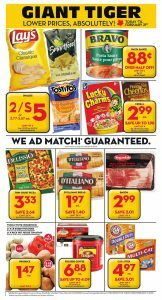 For more details check out current Giant Tiger Flyer. Products of Giant Tiger Flyer March 9 2017 are great quality and great taste. Their stores have the best deals and discounts for everyday. You can take great products with great prices. Also you can help your household budget. Today’s flyer has drinks, snacks and cleaning materials. If you need to make your weekly shopping these products are exactly for you. For lazy nights or when you are in hurry these foods can be very helpful. Frozen dinner options, desserts and also more opportunities are available in their stores. Also all these producst has great deals too. Take as much as you can and taste all the great snacks in everyday. Also you can be need more snacks for spring break. You must be prepared. In this spring break you can have fun with your family with amazing foods and products. Frozen Entrees , $4/ ea. Muffins or Loaf , $2.50 ea. Candle or Wax Melts , $3.47 ea. Cleaner or Magic Eraser , $2.47 ea. Also with these cleaning materials you can make your spring cleaning more easy and and quick. You can be ready before spring arrives. It is good time to reach awesome solutions for shopping now! Their opportunities will continue until March 7 2017. From produce to fashianable apparel Giant Tiger makes your shopping better. Cause of flavor you will be happy and cause of prices your wallet will be happy. As soon as possible you should visit a their stores and stock your needs. They are importing fruits from abroad, they came from long way but I am sure they are still delicious and healthy. 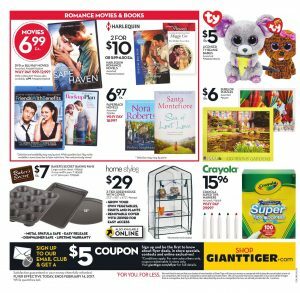 Do not miss to check Giant Tiger Flyer March 2 2017 ! Also in freezer you can find frozen selections such as noodles , sausages , pork chops , salmon fillets , pies. Freshly made and ready to be service baked goods would be good choice if you don’t have time to prepare something. Just visit and buy your favourite now. I think , the best options to reduce to cost of your needs is Chicken breasts or Cowboy steaks for $15 ea. If you buy one of them , you can save $5. For all of them , you can check on page 1. Canned tomatoes or manwitch sauce , $1. ea. Aquastar salmon fillets , $6.98 ea. Hellmann’s mayonnaise , $3.77 ea. Old dutch chips or humpty dumpty snacks , 2 for $5. Revlon hair colouring , $3.50 ea. Stain remover or dryer sheets , $2. Aunt hannah’s swiss rolls , $2.99 ea. Pringles chips , $2. ea. It is time to save your money when you do weekly shopping ! Perfect list of Giant Tiger Flyer February 15 2017 that you can find your kitchen essentials , snacks , apparel , mattress , underwear , movies , decors , cosmetics and more home needs is waiting for you to be browsed. You should check their awesome selection and if you are in search some of them , you should benefit their reasonable prices. They always offer you super fresh and high quality products you deserve. I will try to help you to reduce to cost of weekly shopping with this perfect flyer. Some parts were checked for you and good selection were listed for you. Look at fabulous selection of Giant Tiger ! They guarantee you the best prices for some products. For example ; when you browse cover page of this flyer , you will come across some limited products that you can save more and unbeatable prices. This page contains potato chips , pasta sauce , snacks , cereals , frozen pizza , bread , bacon , mushroom , coffee and cat litter. If you need these products and you are looking for fair prices , here is better place for you. Delissio thin crust frozen pizza , $3.33 ea. Honey nut cheerios , $2.99 ea. D’italiano bread , $1.97 ea. Giant Tiger comes with great savings ! 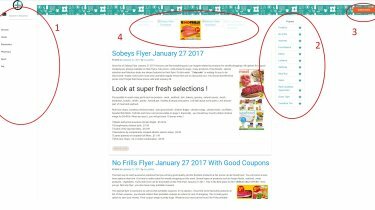 Today on Giant Tiger Flyer February 13 2017, there are many good discounts on various types of products and categories. In addition to all of these, from this day to Valentines Day there are many good deals and special offers for your loved one. You can also plan a good evening for your special one with buying the DVD or Blu-Ray Romence Movies on Giant Tiger such as Safe Haven or Backup Plan. Or you can buy some books, take a coffee and unbrace yourself. Giant Tiger is not only about DVDs or books, there are many options you can buy for your love, yourself or your house such as cloths, shoes or snacks. Now lets see the best deals on this brand new flyer. 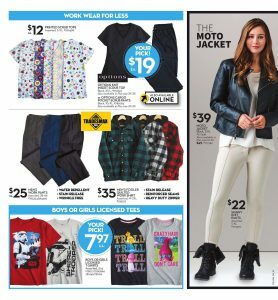 This flyer of the Giant Tiger has many discounts on various types of items and snacks such as Campbell’s Chicken Noodle Soup, Queen size coral fleece blanket, The Moto Jacket or many more. With this flyer on your hand, you can buy the best gift for your loved one on Valentines Day such as new shirt, skirt or jacket. Also you can buy your house needs, make a good meal and put a movie to the DVD player and enjoy this special night. Now, let’s see the best deals on this brand new flyer. 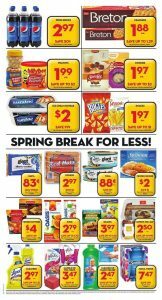 Deals on Giant Tiger won’t end here, so do NOT forget to check out the whole flyer right now. Also you can subscribe our news teller for brand new deals on Giant Tiger and newest flyers on many retailers. See you on next time !